"To bee or not to bee." That is the question. What is the solution? 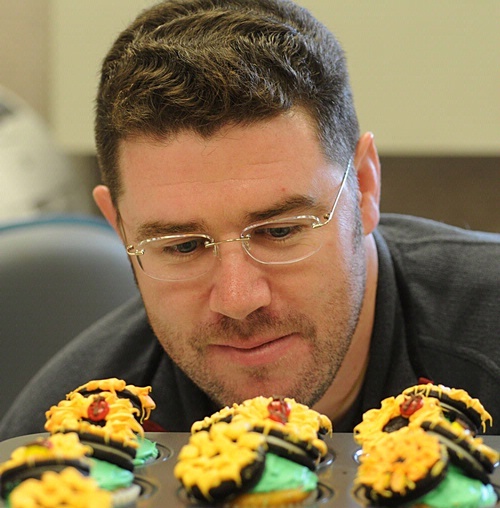 The plight of the honey bees has not escaped the UC Davis Entomology Graduate Students' Association (EGSA). This year's winning t-shirt, the result of a departmental faculty-student-staff-vote, stars the "unsung heroes": the honey bees. Randall "Randy" Veirs, executive assistant for department chair Lynn Kimsey, and communications specialist Kathy Keatley Garvey (yours truly), came up with the winning shirt--Randy created the intricate drawing, and KKG coined the text, spoofing a line from Shakespeare's Hamlet. 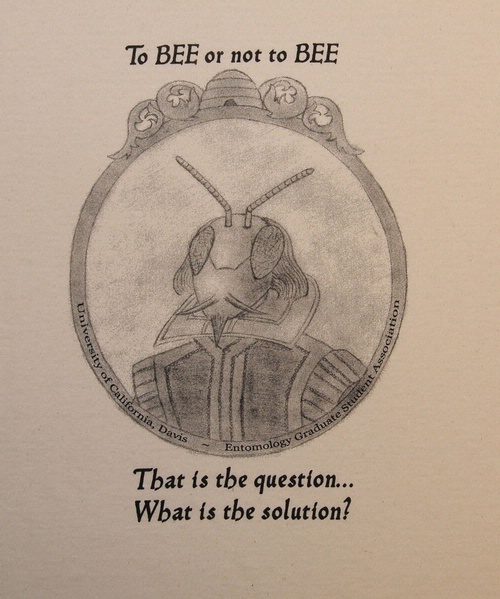 Randy, who describes himself as more of a musician than an artist, drew a framed portrait of a Shakespearean bee in period clothing, complete with an Elizabethan collar. Randy, who plays principal trumpet in the UC Davis Symphony, said he spent several days drawing the bee, gathering information online about proper Shakespearean attire. His brother, Russell Veirs, also a musician (saxophone), helped prepare the image in Photoshop. By the way, each brother has a bachelor's degree in music from UC Davis, while Russell has a master's in saxophone performance from Sacramento State University. Music and art do go together! The t-shirt ties in with Shakespeare's view that "All the world's a stage." (Just add message.) 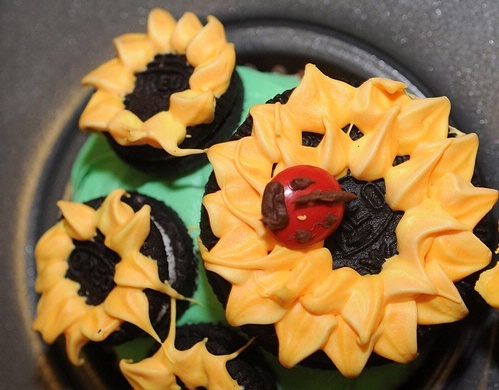 It also ties in with Shakespeare's fascination for bees. One of the playwright's lines from Henry V: "For so work the honey bees, creatures that by a rule in nature teach the act of order to a peopled kingdom." Yes, bees are well-organized and we can learn much from these hard-working social insects. The bee t-shirt is not only raising funds for the graduate student association but raising awareness for the honey bees. Beekeepers throughout the country report they are losing from one-third to 100 percent of their bees due to colony collapse disorder, a mysterious phenomenon in which bees abandon their hives. 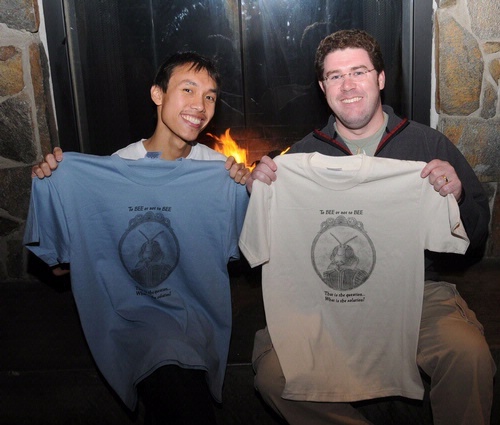 The t-shirts are $15 and available in child-through-adult sizes, says t-shirt coordinator Yao Hua Law, a doctoral student who studies with professor Jay Rosenheim. "The funds will be used for EGSA activities, including the monetary prizes for the EGSA-organized Undergraduate Entomology Research Poster Competition," he said. Contact Yao Hua at (530) 752-4481 or e-mail him at ylaw@ucdavis.edu for more information. Plans are also under way to sell the T-shirts through the University Bookstore, thus making online payments possible and shipping fluid, he said. Other UC Davis entomology t-shirts are also available. One of the favorites is "The Beetles." A parody of The Beatles' "Abbey Road" album cover, the t-shirt features four beetles crossing Abbey Road. Doctoral candidate Hillary Thomas, who studies with major professor Frank Zalom, an integrated pest management specialist, designed the shirt. The take-home message on these shirts is also a take-everywhere message.